HUMAN SCIENTISTS FROM ANOTHER PLANET CREATED ALL LIFE ON EARTH USING DNA. Traces of this epic masterpiece of creation can be found in all religious writings and traditions. It is to them that Moses, Jesus, Buddha and Mohammed referred. It is now time to welcome them. On the 13th of December 1973, French journalist Rael was contacted by a visitor from another planet, and asked to establish an Embassy to welcome these people back to Earth. The extra-terrestrial human being was a little over four feet tall, had long dark hair, almond shaped eyes, olive skin, and exuded harmony and humor. Rael recently described him by saying quite simply, "If he were to walk down a street in Japan, he would not even be noticed." In other words, they look like us, and we look like them. In fact, we were created "in their image" as explained in the Bible. "Now that you are mature enough to understand this,we would like to enter official contact through an embassy"
The messages dictated to Rael explain that life on Earth is not the result of random evolution, nor the work of a supernatural 'God'. It is a deliberate creation, using DNA, by a scientifically advanced people who made human beings literally "in their image" -- what one can call "scientific creationism." References to these scientists and their work, as well as to their symbol of infinity, can be found in the ancient texts of many cultures. For example, in Genesis, the Biblical account of Creation, the word "Elohim" has been mistranslated as the singular word "God", but it is actually a plural word which means "those who came from the sky", and the singular is "Eloha" (also known as "Allah"). Indigenous cultures all over the world remember these "gods" who came from the sky, including natives of Africa (Dogon, Twa, etc. ), America, Asia, Australia, and Europe. Leaving our humanity to progress by itself, the Elohim nevertheless maintained contact with us via prophets including Buddha, Moses, Mohammed, etc., all specially chosen and educated by them. The role of the prophets was to progressively educate humanity through the Messages they taught, each adapted to the culture and level of understanding at the time. They were also to leave traces of the Elohim so that we would be able to recognize them as our Creators and fellow human beings when we had advanced enough scientifically to understand them. Jesus, whose father was an Eloha, was given the task of spreading these messages throughout the world in preparation for this crucial time in which we are now privileged to live: the predicted Age Of Revelation. And most important of all, download and read the free e-book, "Intelligent Design - Message from the Designers" the book which will revolutionize your thinking, transform your life and which is already changing the world. For more information visit http://www.rael.org and discover the truth about our origins. Wow. Certainly the most strange and amusing spam I've seen in awhile. No no no, they werent from another planet, they were from the FUTURE. Get your facts straight. Thanks. Oh man. How many wackos can this forum attract in a week's time? How sad, hes confused...this is an ART forum go paint a picture of that book and them come back. The extra-terrestrial human being was a little over four feet tall, had long dark hair, almond shaped eyes, olive skin, and exuded harmony and humor. Rael recently described him by saying quite simply, "If he were to walk down a street in Japan, he would not even be noticed. Next week on: When Generalizing Retards Order Chinese Food! Just thought I'd point out that this guy isnt even new. Check it. So, how's that fake cloning going? Is this the same dude who posted before about this? About half a year ago or so? Well, I don't see how we can prove these claims either way, so we should probably just teach them in schools and let the children decide what to believe. can somebody ban him or hire a hitman, or something before he pollutes the forum?? Moderator, intelligently design a way to delete this crap. So Jesus spread the word of his Dad, the alien? Then we, their image, killed one of our "creators'" son? If I was Dad, I'd be pissed. No wonder so many rednecks compain about weird dreams and rectal discomfort. Hahaha. Oh man.. you made me laugh tea up my nose. stop it! stop it right now mister. don't make me get the paddle!! Raelian 1, Where have you BEEN?????? Didn't L Ron Hubbard already write that book? yum yum fer yer eyeballs. lol....throw in zenu and the thetans too....might as well make a party of it. hey i'm not just over 4 feet tall. This comment might get me in trouble...so I&#180;m putting my super magic anti-flame coat on. How this new religions make any less sense than the old ones?? It seems to me is ok to laught at nonsense when less people believe in it....and is not ok when to much people do and they have buildings to prove it, in that case you have to pretend to be tolerant. Is not a surprise that religion folows the same patterns than any large or small scale social groups. I imagine in 300 years this will be on the for front of the most populare religion. 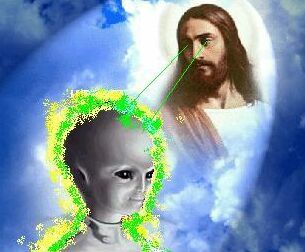 Raelian 1 will be the one of the internet apostles spreading the word of the alien Gods... And we will all be wearing T-shirts with this pic on it forced upon us by the church Google. Now, now, roke. It *could* be real...! he says that aliens abducted him to another planet and that s where he met Jesus, Mahomed, Buddah and Moses. He says they cloned 2 man and 20 women are pregnants of clones (or artificialy inseminated) but they dont want to say in which country it was made for obvious reasons. The difference is simple, the old ones have more followers. * life on Earth is not the result of random evolution, nor the work of a supernatural 'God'. This statement is actually correct. Refering to me? I was merely poking fun at the common misconception that evolution is not guided by anything and matter just come together randomly and forms structures randomly. This quickly leads to strange analogies like tornados in hangars building jumbo jets, etc. Saying it is random is to ignore chemistry, natural selection, as well as the possibility to save and continue on previous builds, this over a very long time period and at multiple locations. Heh, people coming down from the sky... a concept so strange and difficult to come up with (for a man 2000BC) that it must have been aliens. HELP! Can't see sent message!